Fragile Thing - Big Country Feat: Eddi Reader - Written by S.Adamson/Watson - 3.39 Released In 1999 by Track Records. Charles-The Skids - Written by Jobson/Adamson - 2.41 Released In 1979 by Virgin Records Limited. Licensed courtesy of Virgin Records Limited. Stuarts First Single. Republican Party Reptile- Big Country - Written by S.Adamson/Watson - 3.53 Released In 1991 by Mercury Records. You Dreamer - Big Country - Written by S.Adamson - 3.36 Released by Transatlantic In 1995. Licensed courtesy of Sanctuary Copyrights Ltd. Perfect World - Big Country - Written by Adamson/Brzezicki/Butler/Watson - 4.02 Released In 1999 by Track Records. 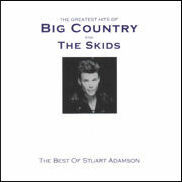 See You - Big Country - Written by S.Adamson - 3.50 Released In 1999 by Track Records. Somebody Else - Big Country - Written by S.Adamson/Davies - 4.00 Released In 2000 by Track Records. This compilation Ⓟ 2002 Universal Music TV, a division of Universal Music Record Operations Ltd. © 2002 Universal Music TV, a division of Universal Music Record Operations Ltd.